Last night, Gerald, Clara and I were having a lovely evening together. Clara and I played while Gerald made chicken parmesean. I made a salad and we had a nice family dinner together. After cleaning up the kitchen, I thought to myself: Gerald is home. I could actually take a hot shower with the bathroom door closed. And that's exactly what I did at 6:20 last night. It was such a luxury to know that I didn't have to peek out of the shower every few minutes to see if Clara was unspooling the toilet paper roll, trying to open the toilet bowl lid, or pulling things out of the trashcan. I got out of the shower and into pajamas - shorts and a tank top. (this becomes relevant later) Clara was already in her nightgown and overnight diaper and the three of us were watching a Mickey Mouse Clubhouse while Clara took occasional sips out of her bottle. Clara toddled over to me and held up her arms: "Mama, Up?" I picked her up and snuggled her in my lap for the final fifteen minutes before her bedtime. Gerald took this opportunity to go into the bedroom for his version of what we call: "letting our brains fall out," which is basically any mindless (yet entertaining) activity we no longer have time for. In this case - Gerald had to go send the heroes of Marvel Avengers Alliance out on quests. 6:58 PM. Time to pick up Clara and take her to her room. She has handed me her giraffe doll and as I pick her up my thumb touches the inside rim of her diaper and comes away covered in poop. Now I have a poopy thumb I am trying to keep away from the giraffe doll and the task of changing her into another overnight diaper. But then I realize there's not just poop on my thumb. There's poop squished up all up the inside of Clara's nightgown. That is enough to send my poopy thumb directly onto the giraffe doll's face as I reflexively flinch in horror. Poopy giraffe, poopy thumb, poopy baby. All this I could have handled until this thought invades my mind: "Why do both of my legs feel wet?" Yes. There's poop running down both of my legs. I call to Gerald for help and we go into action like a crack commando team who have been training for this for years. Ignoring my poop covered legs - Gerald takes the giraffe and nightgown to set them to soak in the sink and has the unfortunate task of wiping the poop I had been too distracted to see off the couch. At this point there is more poop than baby. 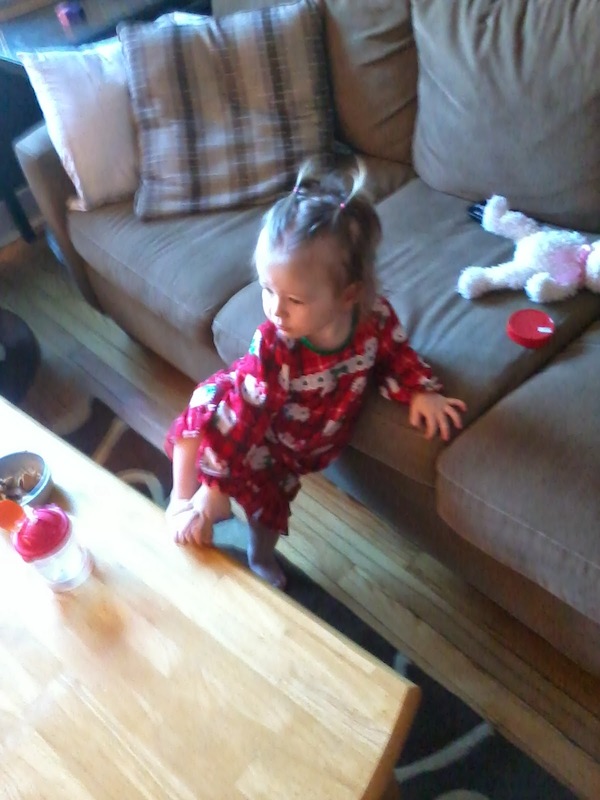 I wipe Clara down with about 400 baby wipes and change her into a new pair of pajamas. Through it all Clara is happy and cooing...I lie her down in her crib, pull out the spare giraffe from its hiding place, give her some milk and head to the shower to finally clean myself off. Clara went to sleep without a hitch and that's all she wrote. Except I am somehow ridiculously proud of us. A year and a half ago we were bleary-eyed neophytes in the ways of parenting. Everything was new and required instant learning curves. Our world had narrowed to the minute details of Clara's every move. Is she wet, hungry, or tired? Is she sleeping? Is she breathing? Is she too cold or too hot? Does she have gas? Is she sick? Is she happy? I don't remember even once asking Gerald if he was okay, hungry, happy, or sick. It was the 24-hour Clara reality show. Fast forward to last night and Gerald and I are the A-Team. Cool, calm and collected in a firefight that would send everyone else running for cover. It's been this way for a while and it's nice to be able to have thirty seconds to string together to appreciate it. The Wonderful World of a Toddler...What the @#!???? Is there anything more wonderful than watching a 19-month old explore a snowy wonderland? 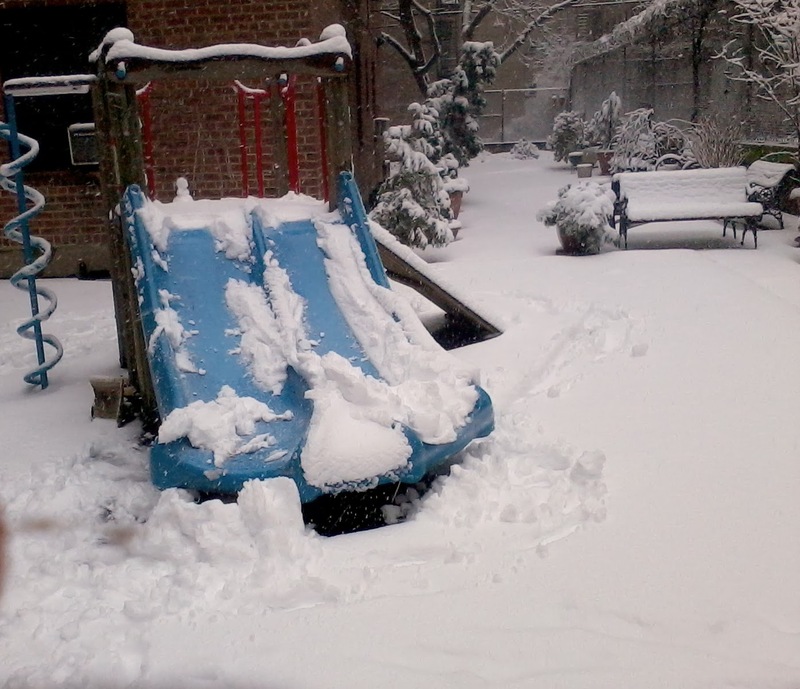 How awesome was it that Clara got to be the first kid down this slide - covered in 5 inches of fluffy snow? She slid down and laughed as she plopped into her own self-created pillow of snow. Then she went down the other slide and laughed even harder. It was fun chasing her around and lobbing snowballs at her that she would pick up and taste. And then I flash backed to the scene upstairs in the apartment a mere hour earlier. I had received a call from work looking for some receipts. As I talked at my desk, Clara was sitting on the floor to my right - in my extreme peripheral vision. All seemed well. She was babbling to herself. I was on the phone for all of two minutes. TWO MINUTES! I turned to my lovely little daughter and was greeted with: Clara, no diaper on, holding out something to me which I quickly realized was a small, round piece of poop she had picked up from the big pile of poop she had just POOPED ON THE FLOOR!!!!!!!!!!!!!! I scooped Clara up in my arms (ignoring the poop pile for the moment), brought her to the changing table, and cleaned her off. All the while Clara happily said: P.U! P.U!